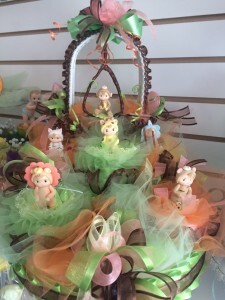 Get elegant custom invitations and eye-catching party favors from Party Time Wishes in Elmhurst, New York. Customers love our printed ribbons, wine glasses, and personalized napkins, among others. Invite guests with stylish invitations that come in different colors, designs, and sizes. Our invites are packaged with an envelope, and are perfect for Christenings, weddings, anniversaries, and baby showers. We also accept orders for wedding invitations using Carlson Craft™ stationery, which are also custom-made. Available in different colors and designs, our custom napkins are great for Christenings, weddings, and sweet 16s. We can include text like names, event, and date. Personalized ribbons make for a lovely party favor. We offer standard-size ribbons that come in different colors, including pink and rainbow colors. These are small ribbons that include names, event, and date. Minimum order is 25 pieces. Regular ribbons are priced at $0.35 each; those with a design at the edge go for $0.75 each; and rainbow-colored ones cost $0.65 each. Apart from printed ribbons, we also make gift boxes and personalized water bottles for baby showers, and decorative wine glasses for anniversaries.